Oh Ruby, I Hardly Knew You. 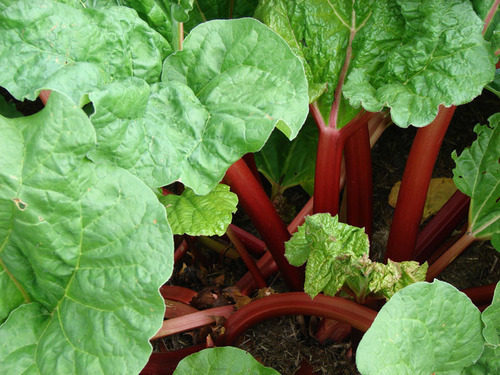 When I lived in Oregon, I had a rhubarb plant in my backyard. She was so beautiful with deep green leaves and bright ruby stalks. She was really a gorgeous gal. But, I must admit that I didn’t appreciate my Rhubarb. In fact, I was downright indifferent to her. Oh, I’d cut her back every year when, or if, I remembered, and I would certainly use her for cobblers now and then, but for the most part, I mainly ignored her. And yet, year after year, she came back as robust as ever. She just gave, gave, gave, and I just took, took, took. You could say that my Rhubarb was a bit co-dependent. So, in honor of my long-lost Rhubarb, I’m going to give her the attention she deserved, and highlight this plant as the next perennial vegetable.